Time to start a new thread on this subject. Well, I don't have much in the way of bullish news to share here, and though I'm not one to be a doom and gloomer, it probably isn't wise to discount the current confluence fundamental and technical data either, so here goes. Below is the worst of all Elliott counts one could imagine, and only that of Super Cycle degree could support. With Monday's break of the divergent lows of the NYSE breadth McClellan Oscillator from last year, and currently probing the all time lows from this same time period, both with regard to structure and momentum considerations, the chart annotated below seems to be the best overall count idea at this time. For those who may be wondering, the implications of such a count would basically mean that we're in for a long and hard bear market that will last for many years to come, and in which, would correct all of the excesses created over the last several decades, and maybe, just maybe, from the inception of the United States itself going back to when stock trading began under the Buttonwood tree of the late 1700's. Kind of numbing to think about, and I'm sincerely hoping I'm misreading the tea leaves. But if we do establish a lower low in the MCO over the next couple of days, and we do see lower lows in the Hist MACD compared with that of the January 2009 decline, this would all but solidify this life changing expectation under the guidelines of this methodology. If this were also to occur, the current degree of trend would be that of one degree higher of what is being shown where the Intermediate labeling (shown in blue - that of months) would become that of Primary degree (that of years) of a still larger Cycle degree (that of decades) of trend. Let's hope, maybe even pray, that this is not the case, and by posting this count idea, in and of itself, that this is more indicative of a longer term bottom extreme that we can look back and smile about later on this year as being absolutely wrong. Stay tuned, but in the meantime, continue to be ultra defensive in thought, with capital preservation continuing to be of paramount importance. if thats the case, then we would be in in the mid point 3 and are in current crash mode at this time? what is it that you see that removes the odds of the count of us putting in minor 5 of intermediate 3? What you're proposing here Dave is more in the areas of either Grand Super Cycle, or worse, Millennium cycle proportions in which it's far too early to even contemplate, no less, fully absorb the dire implications of such a pattern. No, at this time, the count shown is that of a fifth wave extension (marked in orange) of Minor wave 3 (marked in red) of Intermediate wave 3 (marked in blue) in which we've been playing with since last fall as a likely outcome of the initial technical breakdown. The problem here though, economically speaking, is that this fifth wave extension seems to be unfolding with an even deeper extension as marked by the series of 1's and 2's (in green), and this would give us even lower price objectives than what the measuring gap of 10/6 initially forecasted, and with it, a probable Super Cycle outcome. But all of this may be for naught IF the market can find its feet sometime today or tomorrow. In the meantime, the effort of being able to break the divergent NYSE breadth MCO lows of yesterday does give us a reset to any kind of tradable bottom, and with it, it probably won't be until late spring/early summer before a sufficient foundation will be built from where a uptrend can fully develop. As the downside pressure continues to pick up, the current extended fifth wave count shown below remains the best one overall. Monday's action moved both of the NYSE U/D and the ratio adjusted NYSE A/D lines to new lows today, so our main focus continues to be with the McClellan Oscillators that are measuring the current speed of these downside breakdowns. Any new lows below the October 2008 flag points in these McClellan Oscillators will have grave longer term implications and would then allow an adjustment to the current count to that of Cycle degree overall. Wave (iii) is 1.618 time wave (i) at 660.39. 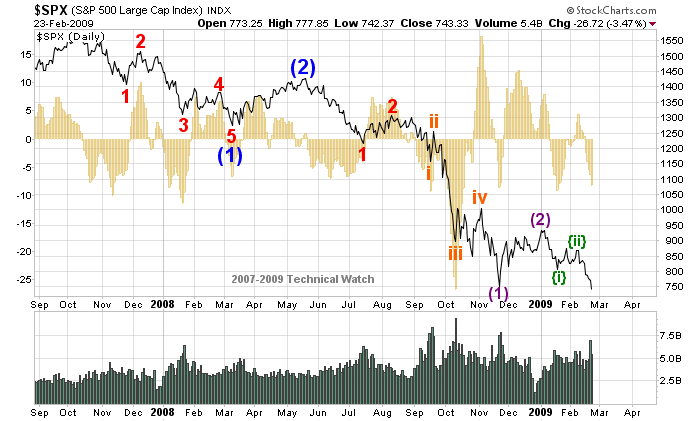 Wave (iv) is .382 times wave (iii) at 740.42 (which would serve as a snapback to the November lows). 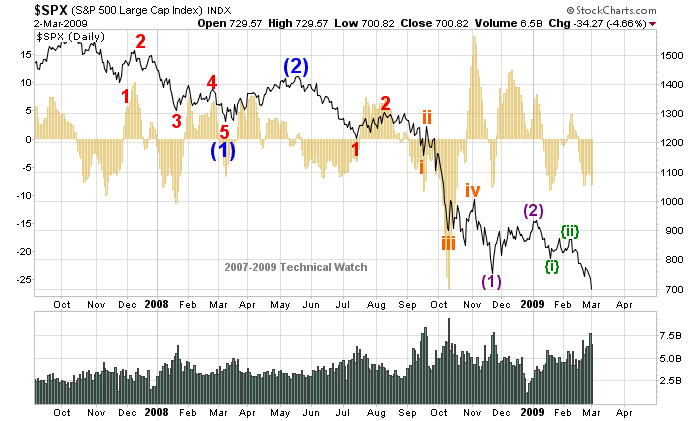 Wave (v) would be equal to wave (i) at 610.94. 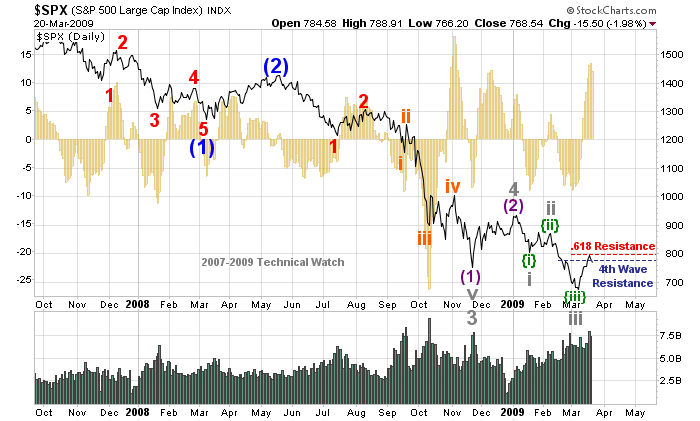 Wave (v) would be .618 times wave (i) at 660.40. Wave (v) would be .618 times wave (iii) at 610.95. With the NYSE breadth MCO moving above its second wave (SOB) highs of January and February today, no less the downside price objective coming within 1% of the Fibonacci target provided previously, shown below is the updated count with this weeks rally suggesting that of wave 4. What we still don't have a firm grasp of at this time is the degree of trend, so I've provided one alternate idea (shown in gray) based on the fact that the NYSE breadth MCO wasn't able to (thankfully) take out the October flag lows during this past three week unwinding process. One big fly in the ointment right now (Elliott wise) is that there are too many folks playing off this same 4th wave scenario, and if everyone is trading off the same pattern idea, things like this usually don't come to fruition as we would like them to. In the meantime, however, with the NYSE breadth MCO now over extended, and the Climactic Volume Indicators "overbought", a pull back is likely near term. Ultimate price resistance is shown on the chart, and as it was mentioned in last weekend's cumulative updates, it's probably best to stand aside and wait for more information before we can make a more consistent judgment on where we are in the intermediate term picture. Fib, At what level SPX close would the wave 4 idea be invalidated? A close above 800? thanks. 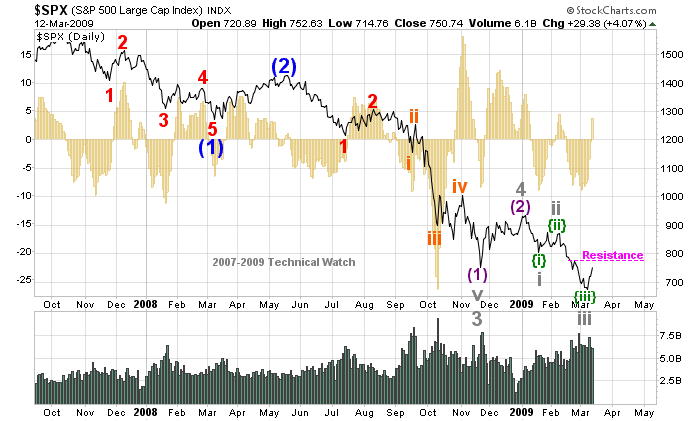 At what level SPX close would the wave 4 idea be invalidated? A close above 800? 4th wave pattern retracement targets will usually be contained within the fourth wave of one lesser degree, and this same level is generally between .382 and .50 times the length of the previous 3rd wave. In this case, the smaller 4th wave highs of 2/24 have been violated, and with it, both the .382 level of 750 and .50 level of 773 (cash) as well. There are times, however, where outside pressure can produce higher targets, but Elliottician's will generally agree that any close above the .618 level of retracement of the previous 3rd wave (in this case, SPX 795) would only then violate the count and where the "alternate count" would become of primary focus. Wednesday's closing highs of 794 is within 1 point of this "line in the sand" target, and so far, the market price action has repelled from this same target zone over the last two trading days. With many short term oscillators highly "overbought" before Friday's action, and with the .618 price target being reached on an important news event, it's a pretty good bet that this perceived "pause to refresh" is probably going to last into next week minimally, and maybe more than that given these same technical and fundamental circumstances. At this juncture then, and to answer your question directly, the "drop dead" 4th wave violation would come if the price action is able to "overlap" the area where wave 1 ended and wave 2 began...the 804-805 cash area (the SOB pattern seen on the chart) would then invalidate the current 4th wave idea both on an intraday and closing basis. Shown below is the updated chart through Friday's close without any count adjustments to what was previously posted for further review. Under the guidelines outlined above, this preferred count idea continues to remain in force...until proven otherwise. Many thanks for your thoughts. The rise is certainly testing the shorts mettle. Along the lines of your last post, if we were to drop in wave 5 from here, many of us (myself included) would look back at the price action of the last few days with the wonderful tranquility of hindsight with more than a little awe at how Elliott's rules and fib and channel boundaries were respected (particularly in the light of monumental government and Fed interventions). With so many people expecting the wave 4, for it to spike higher this hard and long only to the very extremes of the acceptable EW limits only to turn around and resume wave 5 would indeed be the classical type of 'max pain' price action that the market needs to get the necessary RPM up for a capitulatory completion. Apart from the regularly discussed odd circumstances, assuming the market HAS bottomed already at SPX 666, such as the CPC and ISEE put/call data etc, I have been musing on other fora about the NDX/SPX ratio, represented here via the QQQQ:SPY ratio. No doubt you too have noted the continuing relative strength of the NDX over the SPX too. My question is, do you regard this as a valid reason to support the notion that the we have not bottomed yet or do you think it carries little additional value? By the above chart it certainly seems to have statistical validity over the past 18months or so, but I'm not sure if it goes back further than that. If it is a valid indicator that a bottom has not yet posted, then I can see how it might support your current wave count for the SPX. I don't know what your top count is for the NDX, but if the QQQQ:SPY ratio is any guide, the NDX may be about to enter a wave 3 down. That would predict a nice, more traditional, bottoming scenario, where the SPX finishes wave 5 approximately the same time as the NDX finishes it's wave 3 plunge, followed by a wave 1 up and deep wave 2 retracement in the SPX while the NDX carves out a 4 - 5 into a low that is divergent to the SPX.